All month, EW is appreciating the crew and all they dew with a special item on the giveaway wheel! 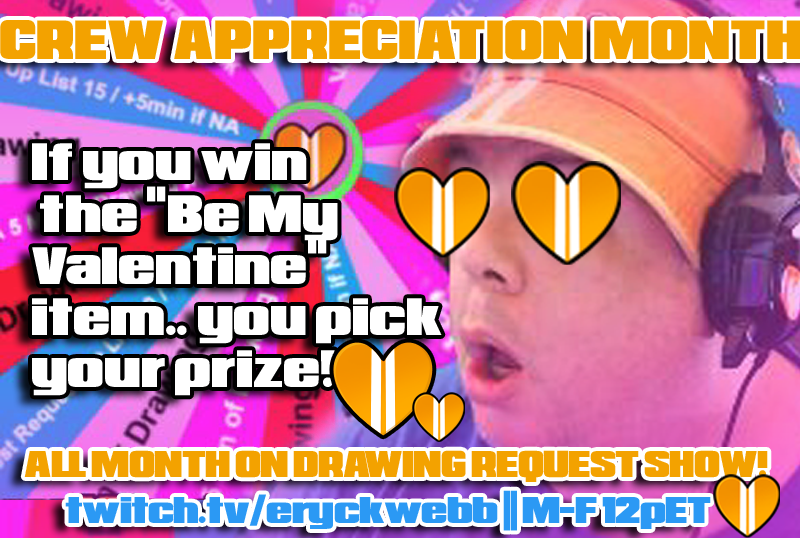 Everytime a giveaway is unlocked, a person subscribes with tier 3 or a subscriber hits a 12 month mark on their subs, they can spin the wheel and try to get Be My Valentine. A BMV prize allows the winner to choose any ONE item that they want the most! This can include but is not limited to, one ink upgrade done immediately, one color upgrade done immediately, a spin at the game of fate wheel, a max-time drawing done immediately, a respin and more! Thank you to the crew, and the rest of yew who make what I do possible. Thank you to those who stick around during my sick days, and during my 'not drawing so good' days. When I'm just goofing off and when I'm focusing on the draws. Thanks for making it possible to get up every day and do what I love to do, for myself and for yew! Happy Valentines month from EWG, DRS, Eryck, Kiwi, Wally and the Hat! Literally could not do this without yew!